I'm frustrated. I'm almost done filling the weave on the fiberglass. 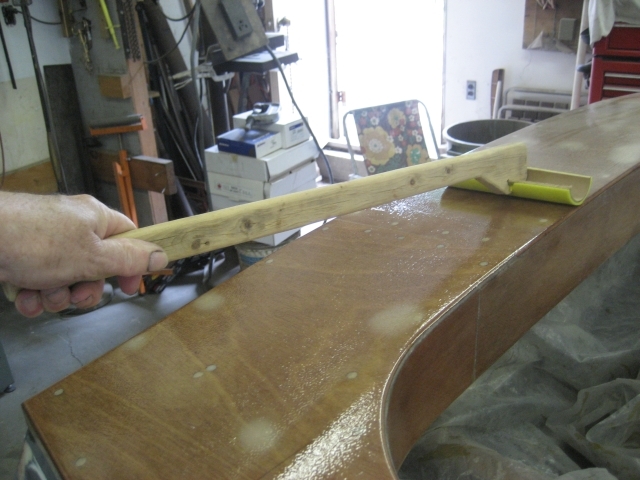 The squeegee spread coat cured fine with no bubbles. The first two filling coats applied by roller set up fine. This last coat gets air bubbles in it no matter what I do. Same roller, same epoxy (Glen-L), same temperature, same humidity. If the temperature is rising after the epoxy is laid down, even just a few degrees it can "outgas" and lots of little bubbles will form. Best to wait late in the day but not so late that dew might form on the surface either. waving a heat gun over the wet resin should make the difference. After applying a light coat of epoxy with a foam roller, 'tip' the epoxy with a foam roller cut in half. Staple the roller cover to the end of a 24" long piece of 1" x 2". The tipping tool is lightly dragged on the epoxy surface until the tool starts to stutter. This breaks up the air bubbles induced by rolling on the epoxy and distributes a very thin coat of epoxy. You'll save many hours of sanding if you can minimize surface texture and runs !